veggie enchiladas (filling: diced firm tofu, spinach, onions, chili powder, garlic powder, salt, tomato juice sauteed in oil for a few minutes, rolled up in corn tortillas, topped with enchilada sauce -- easy recipe for enchilada sauce, here, in the comments, from Belinda at the Frugal Workshop -- then Cheddar cheese and olives. Baked at 350 F for about 25 minutes.) I made just a small batch of enchilada sauce, in the skillet that I fried the tortillas, then sauteed the veggies/tofu. I thinned the enchilada sauce with some tomato sauce, as I didn't quite make enough to cover all of the enchiladas. Still quite tasty! I relied on a lot of quick to fix meals this past week. Some of the dinners came from the freezer stash of me-prepared foods, others were just simple things like pancakes. I bought 9 pounds of frozen spinach yesterday, so spinach will feature heavily as the veggie for a few weeks. I am down to just 1 pumpkin and 1 butternut squash, both in the fridge. My favorite meal this week is a toss-up between Monday's turkey and vegetables topped with biscuits and baked, and last night's veggie enchiladas. Both of those dinners were just what I needed at the moment. Looking back over the week, we seem to be lacking beef and chicken meals. I'll have to incorporate a few of those next week. What did you eat this past week? And what was your favorite meal? 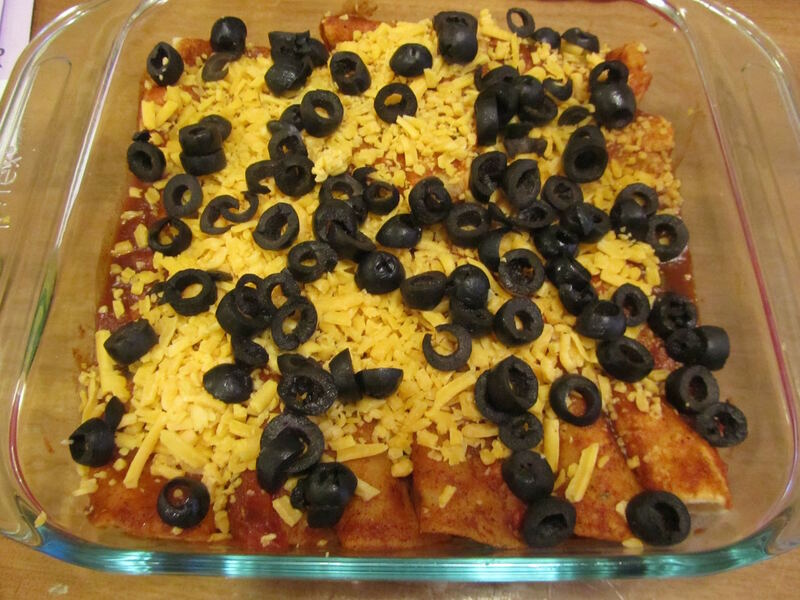 I can't eat tofu, but those veggie enchiladas look delicious! Been busy here, so we've eaten a lot of things from the freezer, too, plus some quick breads from ingredients we had on hand to perk up those meals (and re-stash the freezer, too!) Lots of tasty shakes and smoothies here, too, which we could "eat" while we worked. No grocery shopping at all, until the hubby picked up a gallon of milk yesterday. It sounds like you're doing a great job on eating up what you have on hand. I bought bananas, again, so I'll be back to lots of smoothies, too! That menu looks delicious. I'm trying to think what we all had this week...yesterday was pizza and brownies, Wed. was fried rice and homemade egg rolls with asian chicken in crockpot, Tues. was bratwurst and meatballs with homemade noodles, Monday was leftover meatloaf from Sunday. All were homemade from the freezer supply and all were equally delicious. Tonight is up in the air but baked potato bar sounds good. I think I'll make some homemade bread tomorrow. We're down to one loaf yet in the freezer and a second one being used on the counter. I might have to get a few grocery items tomorrow but not much. Still plan to eat from the freezer and that has been working out so well. Homemade egg rolls sound enticing. I bought wonton wraps for making a large batch of wontons, later this month, for the freezer. I've been craving wonton soup. When you make Asian chicken in the crockpot, what all do you put in? We're down to the very last of the bread, ourselves, and I'll have to add that to chores very soon. I can stretch it with quick stuff like biscuits, muffins and focaccia, but eventually we just want regular whole wheat bread. Good work on eating from what you have on hand! It's nice to make room in the freezers, again. We ate wonton soup (Chinese fishcake, tofu mixture instead of ground pork), with noodles (thin style), won bok and frozen peas. My husband makes a delicious black bean (Chinese fermented), oyster sauce, sesame oil, chili pepper sauce for the wontons and noodles. He fried the leftover wrapped wonton and made "gau gee". He made a different more vinegar-y sauce for dipping. He made a lentil curry with peanuts rice in the rice cooker which he called "slop" since he didn't know what to call it. I loved it. The roasted peanuts was a bit stale to snack on, and the lentils needed using up. One day was all the leftovers...bought more okra from the farmer's market and ate that pretty much plain, but of course my husband can't, so he made a quick mayo sauce for it. He made azuki rice the next day when the lentil rice was gone. Yesterday was kimchee pancakes made with bisquick mix, garden kangkong leaves and green onions. We make this dish whenever we are down to the last few pieces in the bottle, when there is more liquid tHan the vegetable. I don't care for kimchee, but this side dish is a must for my husband's meal as long as there is rice. However, I enjoyed the pancakes on leftover azuki rice. For dinner, husband made a quick spaghetti with garden basil leaves. He said he craved tomatoes. We have not been buying fresh because it is over $2 a pound. We have a cherry tomato plant that is doing quite well in our backyard garden. We also planted beets and Chinese spinach. Well...as you can see I had to think really hard what we ate (gosh it took me that long to type single finger on Kindle fire). Lili, I didn't see your reply that you were craving won ton. Now reading about Alice's egg rolls, I'm craving Filipino Lumpia, made with similar wrappers. These freeze well and can be another great ready meal to have on hand (just have to be quickly fried since the mixture is precooked), very inexpensive to make too. This all sounds delicious! I know, to you, this menu may sound somewhat "ordinary", but much of it sounds exotic to me!! Good use for the stale peanuts. I have an open can, and will think of cooking with some of them if they begin to taste stale. I am also wanting to make cracker jacks, too, with some of those peanuts. I am envious that you have tomatoes and basil growing right now! What a luxury! We get by on canned tomatoes and frozen basil this time of year. With Chinese New Year this next week, Cash & Carry had many Asian items on sale, including tofu, egg roll and dumpling wraps, as well as lots of other items that escape my mind right now. I bought wonton wraps and several packages of tofu, with the plan to make a large batch of wontons, for soup and pan-frying. I do like the texture of ground pork in wontons, but I may use chicken, beef or just veggie/tofu. (I have some pork loin that I could grind up in the food processor, that's a possibility. I'm guessing it wouldn't take very much.) Are there seasonings that you'd recommend for adding to plain ground pork for wonton filling? We usually make our won tons with fishcake and tofu instead of pork, so I had to look up a recipe. We didn't have a lot of the usual ingredients to add, no waterchestnuts or chinese parsley or fresh shrimp which is such a luxury, but will add lots of flavor. Husband thinks the key ingredient is dried mushrooms (shiitake), also green onions, garlic powder, soyu, salt. To bind, he adds cornstarch to the wet tofu/fishcake mixture. But for ground pork mixture, add cornstarch w/water. Lumpia, or Filipino spring roll, is similar to won ton, just add assorted julienne style vegetables like shredded cabbage, string beans, grated carrot to the mixture and wrap it egg roll style. I stirfry the pork/hamburger mixture with the vegetables, cool in the fridge, then add egg and wrap. Also, if desired, add sugar to taste. Just a little to balance the saltiness of soyu. I have to chuckle when you say exotic, because for us it is the simplest and cheapest to prepare. Likewise, I read your menu and I don't know where to begin, to prepare all the variety that is served in one meal. I think I can do close to this. I have mushrooms in the fridge that need using, no cilantro, but I may have chives that I can add to finely minced onion or shallot, plus garlic, soy sauce, cornstarch and could grind some pork. I could minced the mushrooms and just not add water to cornstarch for binding the ingredients, as the mushrooms would have water content. The only flavor I can't replicate is cilantro. I do have ground coriander that I could add a pinch of. Mine would definitely be make-do wontons. But better than nothing, I think. What about ginger? I've seen various recommendations for cooking before/after freezing. I am thinking of filling with raw pork/vegetables, freezing them on a tray, to bag up for the freezer once frozen. And then thinking they'd cook throughly when either sauteed in oil, or dropped into hot broth. How would you freeze wontons? You said you cook the meat mixture when making lumpia, before filling the wrappers. Do you think I need to do that with wontons? The recipe doesn't say to add ginger... I asked my husband if he added ginger to his wontons and he said "oh yah, gives a nice flavor". Pork and ginger goes so well together, why not in wonton right? We didn't add any cilantro in our wontons either. We couldn't grow cilantro in pots last year, but this year we are going to try again in our garden bed. I remember your earlier suggestion, to rough the cilantro seeds with sandpaper to thin the outer seed coat just a little. We had easy things this week. chicken fried rice,Potato soup,split pea soup with corn muffins,Ground turkey tacos,Turkey burgers with mashed potatoes and a green salad.I can't remember what else :). Oh I remember I made waffles yum. Your menu looks good. You're reminding me that I haven't made fried rice in a while. It's such an easy dish and uses up leftovers. Your menu sounds delicious, and easy on the budget. I hope your tests go well today. I'm keeping you in my prayers, Patti. Thank you for the prayer. I go back Tuesday for more tests. I am praying for great outcome. I'm keeping you in my prayers, Patti. I'll be thinking of you on Tuesday. Saturday: Creamy Pumpkin Pasta Sauce (Homemade from a whole baked pumpkin) over Pumpkin Gnocchi (store bought, but on sale from Aldi for less than a dollar). Peas. Tuesday: Bowtie Pasta with a Creamy Broccoli Sauce (frozen garden broccoli). Pumpkin Muffins (from leftover baked pumpkin puree). 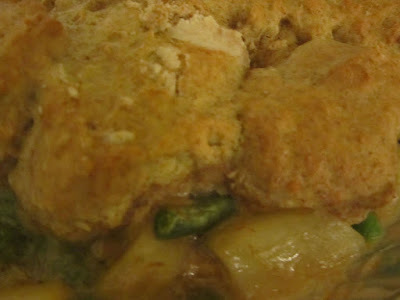 Wednesday: Sausage Gravy (using veggie sausage and stretched with some frozen tofu I had in the freezer needing to be used up (freezing firm tofu makes it 'chewy' in consistency)), using fresh garden sage and homemade veggie stock (I save all my veggie scraps in the freezer), and served over homemade biscuits. Homemade Wild Rice Pilaf on the side (using carrots harvested late last fall and stored in sand in the basement). Thursday: "Greens, White Bean and Walnut Strudel" (using frozen garden greens -- plus phyllo dough I've had in the freezer forever and which needed to be used up already). Served with a Red Cabbage Slaw (using fresh garden red cabbage harvested late last fall and taking up ALL kinds of room in my fridge), plus leftover Wild Rice Pilaf. your menu sounds delicious, and very healthy! Like Kris, I also think the Indonesian dish sounds very tasty. I love peanut sauce, so I think I would enjoy this, as well. The price of coconut milk has been coming down, recently. So this wouldn't be too pricey, either, for me. The texture of frozen tofu holds together better than fresh in stir fries. I also use frozen tofu, mashed, in lasagna, instead of ricotta cheese. The texture isn't an issue as much, once mashed. I have some old phyllo in the freezer, as well. I need to come up with a way to use it. I'd like to make a small batch of baklava, when I have some time. Maybe just before Easter. You get quite a lot out of your garden, Patience! That must keep your grocery spending quite low. Good work! And indeed, tofu is ever so handy and flexible...! Thanks again, Lili -- all my best! Patience, keeping and harvesting a large garden is a huge amount of work. I can only imagine how much time and effort you put into your garden last summer and fall. I have had similar thoughts, "is this really worth all this time and work?". But, as you've found, your work is now paying off. you can make so many delicious meals using what you grew and have put away. That's commendable! I'll keep that in mind, with the coconut and water. Our natural foods bulk section sells unsweetened coconut flakes. I think Cat, here, does the same, for coconut milk. So many of your meals sound like what we eat at our house. I'm intrigued by the enchiladas--I'd like to try them, although my son has a texture thing with his food and I'm not sure he'd go for the sauce. I could probably leave some sauce-less enchiladas out separate for him, though, don't you think? I like the idea of making my own sauce--too much sodium is a problem for me and that way I could control what goes in (does it sound like I repeat myself about controlling my ingredients a lot??). We have had turkey stew/bread, roasted chicken/redskin potatoes, pork BBQ sandwiches/oven fries, chicken thighs in yogurt/honey/buttermilk/basil sauce, and tonight is tacos to accommodate my son and husband having to be out the door early and my daughter having a friend over (easy to serve at different times). We have inherited homemade chicken noodle soup and homemade bread so I think that will be our easy supper tomorrow. Patience has some interesting dinner ideas, especially the Indonesian dish. On the enchiladas, since whatever you put inside is cooked already, you could even just set aside your son's portion, top his with cheese and microwave until hot and the cheese is melted. I do a very quick fry of the tortillas before filling to soften them, and improve the tortilla texture, so that part would already have a "cooked" feel to them. My mom used to make enchiladas a lot when I was growing up. I loved those so much! Your chicken thighs in the yogurt/honey/buttermilk/basil sauce sounds tasty. Is this simply baked in the sauce? My fridge has lots of odds and ends that need using, so I'm thinking some sort of leftover dinner tomorrow night. Lucky for you to have inherited some chicken noodle soup and bread! It's a wonderful recipe--fast and tasty. It calls for chicken breasts, but I had thighs so that's what I used (I find that breasts can get dry--this recipe solves that problem). Combine first 6 ingredients in a 2 quart baking dish. Mix well. Coat both sides of chicken. Cover dish with plastic wrap and marinate several hours or overnight. Bake 375* for 45-60 minutes. I reheated red skin potatoes and rice (leftovers) as sides for dinner last night. Saved me time and got food out of the fridge. I think I may have asked you for this recipe before, and you gave it to me. The mustard jogged my memory. I'm out of yogurt right now, but when I make some more, I'll give this a try with some of the chicken legs I have in the freezer. And for once, I also have honey! So, thank you, again! I think you could do all buttermilk or all yogurt and have it work out--either adds a tangy flavor and (I'm not sure, but I think ... ) the acid in them tenderizes the meat. I have lost track of who I have given what recipes to. :) This one really is a winner--great for those needing a gluten-free meal, and it's soooo easy. A bit late to the fray, but joining in because everyone's meals sound so yummy and are so inspiring. Lili, if you are thinking about coconut milk substitutes, some folks I know who follow the Eat to Live plan (oil free vegan) use a small amount of coconut extract mixed with the nut or bean milk of their choice. "souped up" packaged ramen -- i add mushrooms, sauteed tofu (or sometimes just cubed tofu), green peas or edamame, ginger, garlic and sesame oil to the cheap packaged mixes. we don't eat it a ton -- still a lot of sodium, but we do enjoy it! mixed bean stew with winter squash, for tomorrow evening. i cooked the beans this morning and will put the rest of the stew together tomorrow morning before I work. My husband can heat it up in the evening so it's ready for when I get home. This is one of those dishes that really tastes phenomenal after sitting for a while. I'm looking forward to it! Ramen is always a dollar stretcher, isn't it? And not too bad when you add improvements. Your version sounds quite delicious. I especially like the addition of sesame oil -- that adds so much flavor! Laura, what all do you put in your bean stew? It sounds hearty and warming! Oh, great on the eggs!! I've heard that others have found eggs for 99 cents/dozen in the last week or two. I'm hoping that is a sign of lower egg prices, overall this year! 1. Soak beans and cook in 8 cups of water. When tender, add salt to taste and reserve 1.5 cups of the cooked beans. Set cooked beans aside for now (I usually cook them ahead and remove to a tupperware so that I can reuse my big pot). 2. Heat olive oil in a large stock pot and saute onion about 5 minutes. Add paprika and cook one more minute. Add garlic and cook an additional minute. 3. 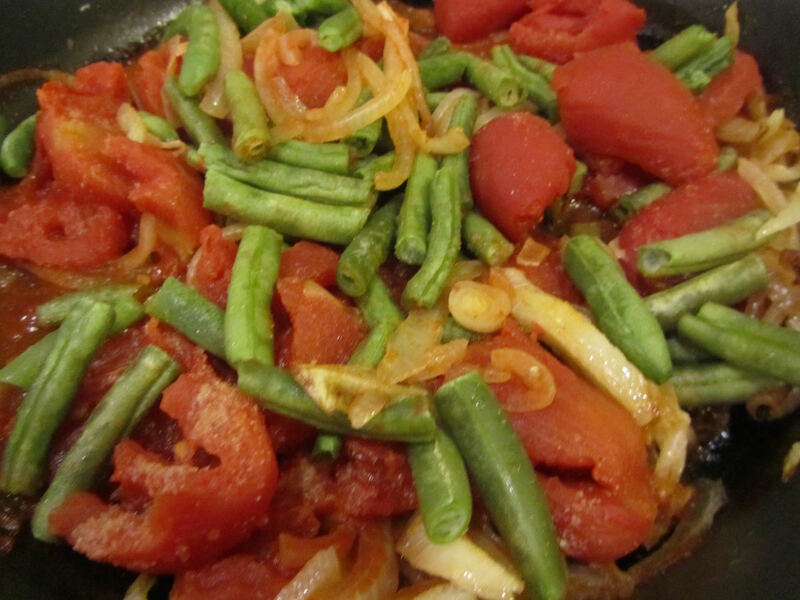 Add tomatoes, cooked beans, squash, lima beans and bay leaf. Bring to a boil, reduce heat and simmer at least 30 minutes, until squash is cooked through. 4. Remove bay leaves and stir in frozen corn. Cook an additional 10 minutes and stir in fresh parsley if desired. Good with cornbread or garlic bread! Oh, I forgot. Between steps three and four you puree the reserved beans and stir them in with the frozen corn. It's not necessary and it's the primary difference between the NYT recipe and the one in my cookbook, but doing so adds fantastic texture to the soup. And it can be any winter squash -- I have butternut on hand, but pumpkin is also suggested. I think it would be about 4 - 5 cups of chopped squash. Thank you, Laura. This stew sounds so delicious! Well, with the opening of the new Sprouts Market near me, I've been eating a bounty of fresh veggies. Seriously, fresh broccoli and cauliflower for under 50 cents per pound... it's hard to pass up! They have just amazing prices on produce in general. Plus I'm, ahem, on a bit of a diet because I fear the past few months have been light on biking and heavy on baking! I think my favorite meal was the chicken teriyaki salad - baby kale and spinach with snap peas and leftover chicken tossed in a teriyaki vinaigrette - sooo yummy! It sounds like Sprouts has some amazing produce prices! Enjoy all of those fresh veggies! That teriyaki chicken salad is making me hungry this morning! Yum! Thanks for the heads-up. I have no idea why, and no clue how to change it. But as you've found, there is one up-side -- you do get to read other comments and gather ideas for your own menus.